Ever since my Friday morning visit to Footscray the other week I have developed a real taste for Vietnamese iced milk coffee. I usually only drink coffee in the morning and the other morning I decided I wanted a Vietnamese coffee instead of my usual flat white. I wasn't sure where to find one in the CBD so early so I headed to Swanston street to try my luck. Unfortunately none of the Vietnamese restaurants are open at 8am so I despondently headed back to William street where I work. On my way I decided to try my luck at a little cafe in the foodcourt in the ground floor of the Cambridge International College building at 422 Little Collins Street. 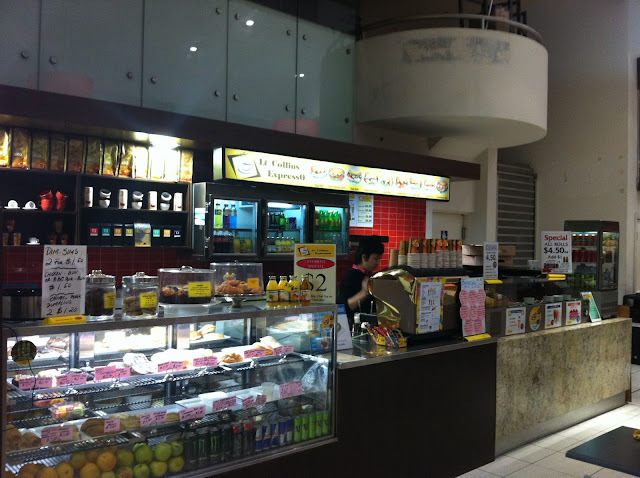 The foodcourt is a bit of an odd one, it has quite a few vacant shops and almost resembles a deserted uni cafeteria. I don't think a lot of people know about it but its one of my favourites, mostly for the recently opened Issara Thai, but I'll post about them another time. This morning I had a feeling that one of the other shops, Little Collins Espresso might be a chance of selling a Vietnamese coffee. I had often looked at this place as they have signage offering western style Banh Mi which led me to suspect that the proprietors were Vietnamese. 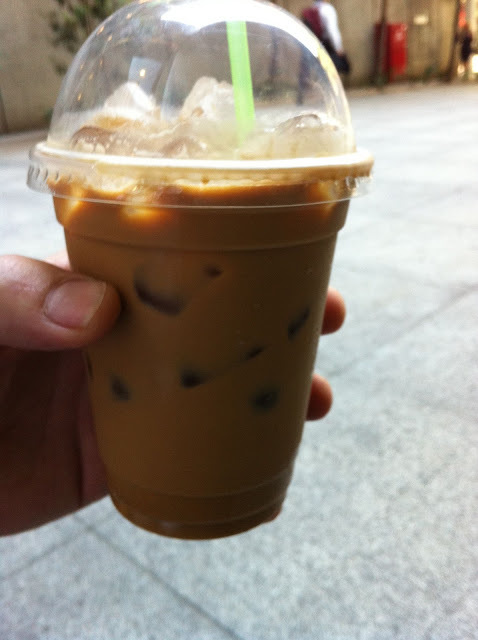 I was very pleased to learn that I my suspicions were correct and for $3.50 the very friendly owner whipped me up a delicious and very strong Vietnamese iced milk coffee. For anyone who hasn't tried one before and who doesn't have the luxury of being able to visit Footscray for their morning caffeine hit I highly recommend a visit to Little Collins Espresso. I know my seasonal timing if a bit off as its starting to get a bit cold in the morning for iced coffee but the cold sweetness is just so lovely and soothing in the morning and a nice change from the usual Italian espresso. I realise that the use of condensed milk probably pushes the sugar content a bit higher than an espresso but I like the fact that the Vietnamese caffeine offering has a lot less dairy with a few spoonfuls of condensed milk versus the standard espresso having probably around a cup of milk. Those worried about not receiving their morning caffiene boost certainly need not be concerned, I was feeling the effects of this one for several hours afterwards. As a bit of trivia to finish with, when we visited Dalat in the Vietnamese central highlands a couple of years ago our tour guide Thitty informed us that Vietnam is the world's third largest producer of coffee beans. So there you go! Yay, I have put you in my Bloglovin reader listy thing and now I get your posts to my inbox daily! Who would have thought you'd find Vietnamese coffee there in the city? I do love it, crazy sweet rocket fuel it is. Look forward to reading about Issara Thai!